The following article by Mark Busse was published on January 31, 2014 in Design Edge Canada Magazine. How I fondly recall the day my very first box of business cards landed with a thud on my desk. It was my first job after university and I was so damned proud to see those letters after my name followed by my title. I felt like one of the lawyers in the business card scene from American Psycho. But that was two decades ago. These days we live in an age of digital everything, where a bump of our smart phones exchanges contact info, apps can converts cards into contacts, and emails automatically extract contact details for us. Business cards have incredibly short life spans, some even argue they are hardly required at all. But that’s missing the point. Business cards can say so much about you and your corporate identity, but regardless of how beautifully designed and produced, they are simply pieces of paper with information on it. While useful and important, it is in that moment when you first meet someone and hand them your card that reveals their value. Instead of merely a selling device, where you want something from the person receiving it, your business card can be viewed as a gift, associated instead with what you can offer that person. A recent edition of Wayward Arts magazine got my attention recently, in which Montreal design firm Paprika created a series of business cards for dozens of history’s greatest individuals, from Jesus to Mao Zedong. As an old print production wonk, I couldn’t help but start calculating how many hours this endeavour must have taken, not to mention the inordinate costs associated with producing so many different designs, on a variety of paper stocks, with a dizzying array of printing and finishing techniques. Some of the designs were trite and derivative, others I didn’t understand at all, but many were clever and really grabbed my attention. But this amazing collection of designs made me realize that business cards are more important now than ever before BECAUSE we live in the digital age. They can be a powerful conversation starter that breaks through the clutter when used by a practiced networker. While in Asian cultures business cards are still highly regarded expressions of status deserving of deep respect, North Americans pay little heed to this old fashioned communication medium. They are often over-designed to the point of gimmickry, even though their value and lifespan is limited, destined for the recycling bin in most cases. But they still serve a purpose. What really bothers me about business cards is how they are typically the tool of the self serving, thrust into my face as someone promotes themselves, asking probing questions about my business, seeking that which I can do for them. Seldom have people presented me their card with a kind offer of “What can I do to help you?” But I assure you, I remembered and followed up with those that did. Like many of you, I attend a plethora of business events. I load my pockets with business cards and head into the crowd, often encountering this business card exchange ritual as we all seek contacts who can benefit us, be it a future client, employer, vendor, or otherwise. In these situations, business cards typically become a part of a gesture of need and want. THAT’s what bugs me. Let’s avoid condescending prattle about the merits of a good business card design as a component of brand building. From colours, font choices, paper thickness and finishing techniques, to what information you should include, graphic designers all know that there are a myriad ways to design a business card. If you’re reading this, then you were likely taught all that stuff in design school, and the Internet doesn’t need another article on how to create a great business card, so let’s skip all that. What I’d challenge you to consider, is what the combination of graphic design and the content/info on your business card actually SAYS about you and your organization. Not just does it have a logo and address on it, but is there a bold declarative statement about what you do? Consider that your business card is not just a piece of inert stationery, but a part of a broader interaction strategy. What does your card actually SAY about you? After you hand someone your card and explain what you do, will they remember you? I often find myself back at my desk after events, going through collected business cards, wondering who those people were. If I have to go to a website to figure out who someone is or what they do, then they’ve already lost my attention. I once found a card that brashly stated “Google me” and guess what, I didn’t. Now, had that person really impressed me with their introduction, revealing something interesting about themselves and capturing my attention with intelligent conversation, and especially if they emphasized what they could do for me instead of the other way around, perhaps I would’ve found the card clever and compelling. As it was, I immediately threw the card away. The best business cards I see these days are those that unabashedly state a craft, position and offer something of value. I’ve seen cards with bold statements and messages, even a few with a call to action offering a free consultation if I contacted them. And that brings me back to the “need and want” paradigm that business cards are often associated with. 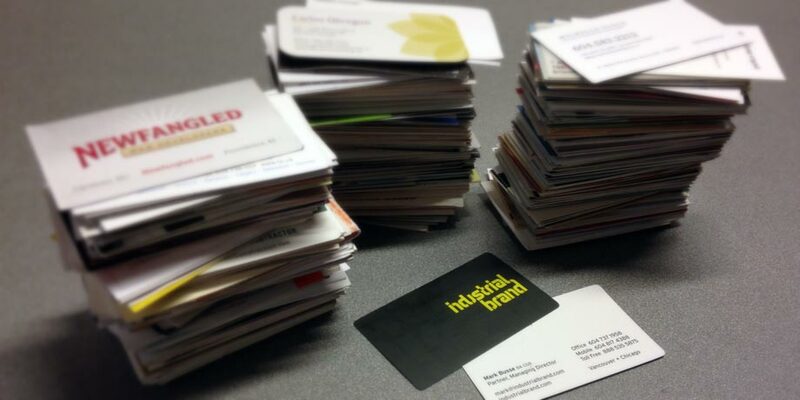 Business cards are introductions, often literally accompanied by a handshake and something along the lines of “Nice to meet you, my name is Mark Busse and I am the managing director of Industrial Brand.” So what? What does that mean? You’re going to end up answering the “What do you do, Mark?” question anyway. So skip some of the extraneous pretty nonsense we designers are so used to and include some of that on your next business card. In fact, consider how you might include something uniquely personal about yourself to get the attention of the person and increase the chances they’ll remember you later. Some people argue in favour of including a photo of yourself on the back of a card, but unless you’re a gorgeous fashion model or an actor, where your looks are a factor to the business, I personally can’t stand this approach. More importantly, in my view, all too often the business card exchange is associated with a selfish act because we WANT something from the other person and hope that this magical piece of paper will entice them to get back in touch with us. The reality is that they most likely will not, unless it truly is compelling and what you offer is absolutely what they need. However, what if we considered all the above, and yet approached networking from a place of GIVING? Imagine if our business card was paired with a personal elevator pitch that quickly turned the attention on the OTHER person with inquiries into what you can do for them? Not in terms of the services you offer and would be happy to sell them, but how we can help them? Perhaps with an introduction or referral? Or a bit of wisdom you recently learned that they could apply in their own career? I guarantee this approach works—I use it all the time. So next time you’re faced with a business card design project—for yourself or a client—ask yourself, “Why would anyone give a hoot about these?” and keep in mind that these little pieces of paper are likely headed for the recycling bin anyway. Of course we should strive to design compelling and meaningful concepts and symbolism that will convince others of our creative talent—and make no mistake, that is crucial—but the goal shouldn’t be to make it onto the next list of business card designs that will make your brain explode. A business card should be a reminder of a wonderful introduction and compel people to follow up, ultimately to start a relationship of some sort. The severe limitations of the business card format makes it one of the most fun challenges designers face, but remember to look beyond fancy graphic or printing techniques to consider what literal message is being communicated by these little information vehicles in the digital age. If it’s just addresses and numbers which can easily be found on the Internet, then you’ve failed. Design something that elevates these seemingly obsolete bits of stationery detritus to that of a conversation starter that expresses something special about the company or person it represents. Strive for a card that causes new contacts to pause on examination and say “Wow, nice business card!”, while other times perhaps a simple line or two of copy might be appropriate and compelling. Remember the scene in American Psycho, where a basic one-sided card, with crisp lettering, on off-white stock of tasteful thickness with a watermark was enough to elicit a powerful emotional reaction—mind you he was psychotic. As much as we live in an age where a wave of a smart phone can constitute a connection, it just doesn’t work as well as an analog expression of kindness, captured and symbolized by a tiny piece of paper called the business card. Got any business card design stories or tips you can share?